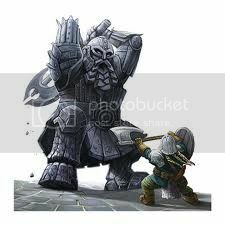 Often standing either side of an entrance to a dwarven stronghold, Stone Guardians are huge stone statues built to resemble a dwarven warrior in full armour. Unknown to most these Stone Guardians are magically created automatons, brought to life by the glowing magical runes carved into them by dwarven Runesmiths. 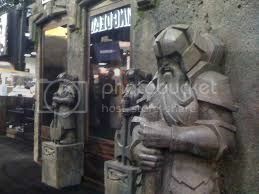 In dire need a dwarf army will call the Stone Guardian into battle to protect their strongholds. They are slow ponderous creatures, but once in the thick of battle they can break through any defence. Being mindless, Stone Guardians can do nothing without the orders from a Runesmith. I was tempted to go for 3+ Armour, but thought it might be too powerful with 6 hits as well? So one 28mm dwarf, painted grey, with a wash for shading, on a 20x40 base. Sounds very simple to create . Although the impression I get is that the dwarf army needs lower points cost units, as most of their units are high cost. IMHO this kind of units are good for scenarios or single games rather than a add on of the list, so it is not a problem for me the high cost of the unit. Allow them to take Halfling mercenaries? How long would the baggage train be for all the food they'd need to supply?! I think a massive stone guardian type figure would look cool.